For most countries in South East Asia, you either don’t need a visa, or you can get a visa on entry. But for Vietnam, you need to get a visa in advance. It’s possible to arrange a visa on arrival in advance by applying online, an option we cover below, but it’s also possible to arrange for your visa by visiting the Vietnam Embassy in Bangkok, Thailand. Before we dive into the specifics of getting a Vietnam visa from the Vietnam Embassy in Bangkok, I first want to address those travelers who perhaps want to avoid the hassle of finding the embassy and generally waiting until you arrive in Thailand before arranging your visa. There are many people I know who prefer to get these things planned before they arrive! If that is you, I recommend you connect with Vietnam Visa, a reliable online service that can get you set up with a VOA (Visa on Arrival) without the hassle of visiting the embassy. If you need more help, refer to the Renegade Travels Vietnam Visa Guide. The Vietnam Embassy in Bangkok is easy to get to by either skytrain (BTS) or taxi. If going by skytrain, get off at Pleon Chit station, take exit 5, and then walk to the end of the walkway. Then turn left and go down the steps onto Wireless Road. The Vietnam Embassy is 2-3 minutes walk from there. The sign for the Embassy is high up on the wall, so keep your eyes open, as it’s quite easy to miss. The entrance is a few meters passed the sign. Once inside, complete the application form, and proceed to window 1. You will need one passport size photo, and the visa fee in Thai baht. We applied for single entry 3-month visas, and the cost was 3,300 baht (around $110, £75, EUR85) each. This is the cost for collecting the visa 5 days later. You can pay extra to pick it up the same day or the next day. We applied on a Thursday and returned to pick up our passports on the next Tuesday. Download the application form from Vietnam Visa Application Form. Be sure to get a multiple entry visa if you’ll be entering Vietnam more than once during your stay. After both getting a 3-month visa at a total cost of around $220, these proved to be almost worthless when we arrived in Hanoi. I was told that even though my passport showed a 3-month visa, the computer only showed a 1-month visa. We both ended up being stamped in for one month. We were then expected to pay almost $200 extra to extend for another month. We feel totally ripped off. I therefore wouldn’t always recommend this route of getting a visa, unless you’re going to be arriving in Vietnam by land. If we visited Vietnam again we’d get a Visa On Arrival through Vietnam Visa. So we totally wasted our money. Beware! 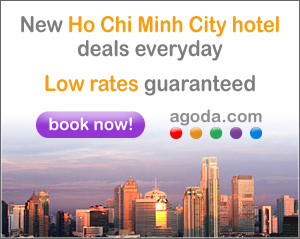 You can book hotels in Vietnam by using the Agoda link below.